After a year of plans, consultation, discussion and revision, the proposal for the enhancement of the Holland House terrace, café yard and re-siting of the approach road, an application for planning consent was lodged with the Council on 27 January 2017. A number of pre-planning meetings took place to ensure that the RBK&C Planning Department felt the proposals were appropriate to the environment of Grade-1-listed Holland House. Public consultation ran until 24 February, so by the time you read this newsletter, the proposals will have undergone a further level of scrutiny, and planning officers will be going through the process of making a decision. That decision will come before the Planning Application Committee in the second half of March. 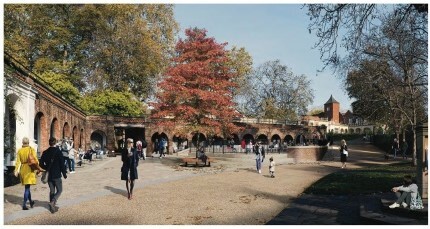 We set out in our last newsletter what we consider to be improvements to the area, and we believe all the consultation and debate has been worthwhile, as the new landscaping will make the café yard and the Holland House terrace much pleasanter spaces in which to spend time. The re-siting of the road will be safer and less disruptive to café users. The drawings that accompany the application are the best way of showing what it will look like, and you might still be able to view the many documents on the RBK&C planning website under case No. PP/17/00353. On the assumption that the plans are accorded consent, the work will start immediately after the 2017 opera season.